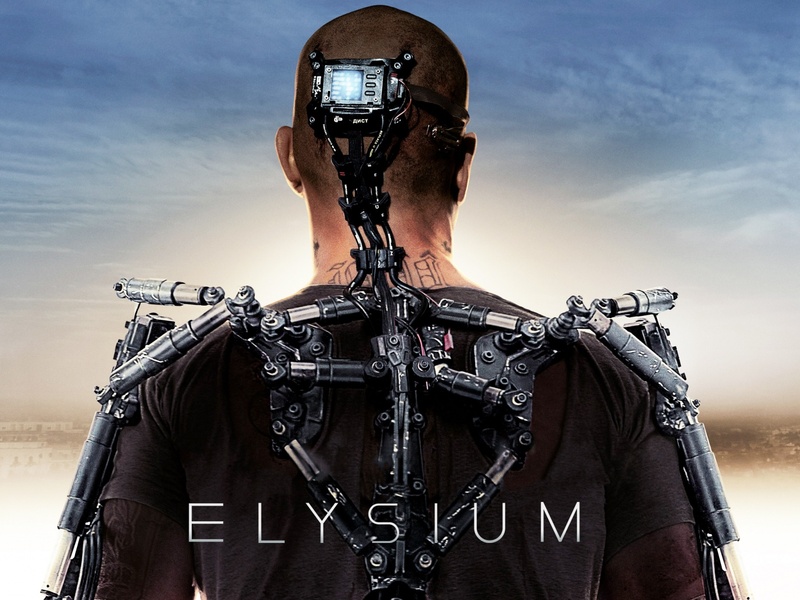 Elysium, the much-anticipated second feature from writer/director Neill Blomkamp, is an absorbing and intelligent bit of sociologically pointed caste conflict futurism that builds on real, present catastrophes to craft the carefully constructed horrors to come. The year is 2154, and the world’s elite has long decamped for the titular gated community in the sky, while the less fortunate toil away on a decrepit and dangerous planet that has undergone economic and environmental collapse. The paradisiacal space station colony hovers just outside the Earth’s atmosphere, a short shuttle ride away, taunting the downtrodden proletarian masses with its unattainable proximity. Sound vaguely familiar? That’s because the South Africa-born filmmaker once again goes for bold (if blunt) political parable, substituting a polluted, overpopulated, and largely Latino Los Angeles for the racially-charged Johannesburg of his previous film. Blomkamp came out of nowhere with 2009’s District 9, an action movie with an acute social consciousness that only thinly disguised its apartheid allegory in crustacean alien guise. An unexpected critical and commercial triumph and a low-budget aesthetic achievement, the visionary film did a lot with a little, the striking production design, cinematography, costuming, and effects seemingly, against all odds, willed into being by its young creator—Blomkamp was not yet thirty when shooting District 9, and working with a budget of fewer millions than he had years. Four years have passed, and the director makes a poised entrance into mainstream popcorn cinema. Although the sets are grander and the stars more famous, Blomkamp maintains much of the grit and grime, intensity and ingenuity of District 9.Working with a larger canvas and a more conventional framework, his Elysium plays like a cross between its smaller, scrappier, and often more searing predecessor and a big-budgeted, little-minded blockbuster. Class warfare has been a rich trope for science fiction fantasies ever since Fritz Lang’s 1927 Metropolis, a movie Elysium at times resembles, especially in scenes portraying mega-corporation Armadyne’s army of industrious worker bees slaving away on the factory assembly lines. One of these lowly laborers is Max (Matt Damon), a reformed car thief who dreams of one day buying his ticket to a better life. An accident at the plant in which he is exposed to a toxic dose of radiation leaves him with only a few days to live. Enter black-market smuggler and revolutionary Spider (fiery, fantastic Brazilian star Wagner Moura), who promises Max passage to Elysium, where each home is equipped with healing pods that literally cure any ailment you might have in seconds. Damon jumps in and out of roles and genres as blithely and artfully as he dodges bullets, sprints across arid wastelands, and springs from rooftop to rooftop, making you care greatly if he falls. At once boyish and middle-aged, he’s a great actor of likeable, homegrown American heroes and easily conveys sincerity, strength, and moral decency. As Max, he finds passion and purpose in the abundantly armed Everyman in bionic getup who finds himself on a messianic quest to lead the 99 percent out of darkness. Less inspiring is Max’s standard-issue love interest, childhood friend and fellow orphan Frey (Alice Braga)—cue the sun-kissed images of children running in slow-motion, as if to give the viewers more time to take in their innocence and promise. Now all grown up, Frey spends her time working as a nurse and gazing up at that shiny torus-shaped satellite in the sky with both hope and spite as her daughter slowly dies of leukemia. Meanwhile, on Elysium, the elegant and icy Secretary of Defense Delacourt (Jodie Foster sporting a supremely indeterminate international accent of sorts) struts through poolside cocktail parties speaking perfect French, unflinchingly shoots down “illegals” who try to land, and rigorously fights for her right to use unlimited force to protect the liberties and luxuries of a few. The puppet president (Faran Tahir) doesn’t approve of her tactics—although it’s never made clear if he thinks it’s in bad faith or it’s just bad PR—so the ever-resourceful Delacourt starts plotting a coup. She’s aided by Armadyne’s slithery CEO John Carlyle (William Fichtner), who developed Elysium and all the technology that makes it run, and ruthless rogue Kruger, an earthbound special ops mercenary (played by District 9’s Sharlto Copley with a South African accent as thick as the billowing clouds of smoke ascending into the hazy pink sky above L.A.). His villain makes for a vicious and volatile screen presence as terrifying as he is darkly funny. “I don’t believe in committing violent acts in front of children,” he tells a little girl as he interrogates her mother, then advises the child to keep her eyes closed. A botched kidnapping and successful information theft are Max’s way out, but, after downloading classified data from Carlyle directly into his nervous system, the hero essentially has two time-bombs ticking away inside of him, one in his brain, the other his bloodstream. Damon is known for squeezing nuances out of stereotypes (as he did in his three Bourne outings), but, although convincing for much of the film’s running time, his character here never reaches its full potential. Halfway through Max loses that glint in his eye and the appealing unpredictability of a man urged by selfish feelings of self-preservation instead of grand ideas of spiritual sacrifice. Outfitted with a cyborg-like metal exoskeleton—literally a new backbone—Max spends much of the disappointingly generic final battling assorted earthlings and Elysians in high-tech fistfights, with Kruger going at him like a human Transformer from hell. 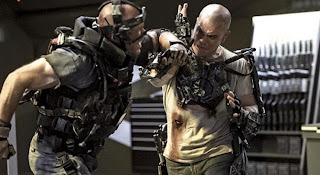 For what it’s worth, Elysium’s fight/chase scenes are sharply conceived, well choreographed, and not nearly as excessive as what this summer’s movie fare had made me both expect and fear. But Blomkamp proves better at blowing things up than putting the shattered remains together. His speculative solution to the imaginative worst is Max’s half-baked plan to open the Elysian gates to the masses. The film touts an openly socialist political agenda, championing not only universal healthcare, but also open boarders, unconditional amnesty, and abolition of class distinctions. The absurdly simplistic ending, however, makes no attempt to address the overpopulation, pollution, and scarcity that got us in this dystopian mess in the first place. If Elysium falls short as social commentary, the movie never fails or falters as entertaining storytelling. The action is straightforward and exciting, if a bit too eager to please the studio’s unrelenting need for scenic conflagrations, chases, and shoot-outs. Blomkamp immerses us in the disparate, often desperate worlds of the haves and have-nots in a society that’s rigged against the poor. 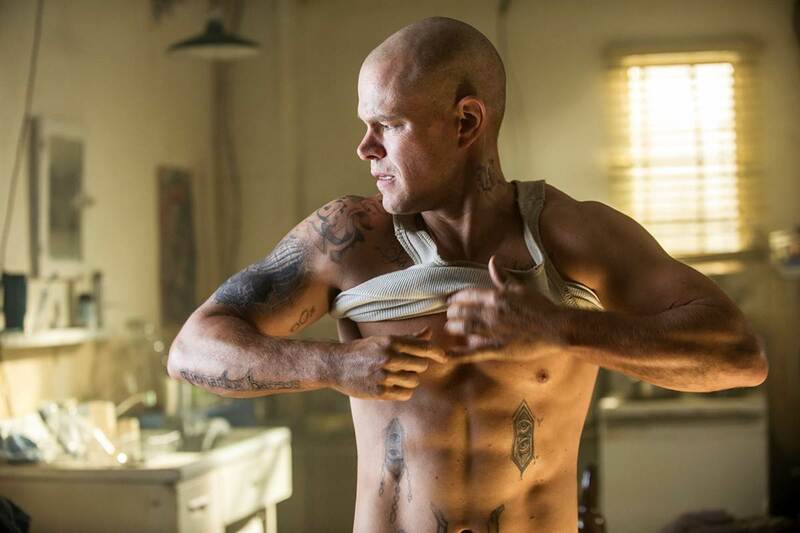 From the opening sequence we are swept up by swooping camera moves over the seemingly endless, sprawling urban slums and upwards, into the pacific beauty of Elysium, an affluent, studded suburb of sleek curvilinear modernism and immaculately groomed lawns. Working in a genre that is said to make the strange familiar and the familiar strange, Blomkamp and composer Ryan Amon make sure dread creeps in with each note of the brassy, basso profondo score. While the promised land’s privileged populace inhabits a clean white blur of country clubs and cocktail parties, the underclasses live short, brutish lives in filthy, teeming cities. Earth is one big dusty and destitute shantytown of cluttered streets and crowded hospitals, run by an impersonal robot police force that apparently hasn’t had civilian rights hardwired into its memory drives and brutally enforces law and order, breaking limbs and offering undisputable sentencing while politely pretending to care about the individual. A trip to the parole office is like visiting a DMV, with the same numbered tickets, light-up displays, and hour-long waits, and when your turn finally comes you get to speak to a graffiti-scrawled robot with chipped paint who senses any blood pressure increase (and offers a pill) and can understand tone of voice well enough to pose questions like “Are you being sarcastic and/or abusive?”—“Negative,” Max replies in his best RoboCop impersonation, only one example from a script speckled with low-key, biting humor. From watching the trailers, I had written this off as something that could wait for video. Wonder if I should change that, now. Your review is much more positive than I was expecting.